· For transmission of shares firstly see value of shares if value is more than Rs. 2,00,000 then will is compulsory. · In absence of will. Letter of administration is required which can be available from court or Copy of Succession Certificate duly issued by a competent court. · If value is less than Rs. 2, 00,000, then, no aforesaid formality is required. · Besides that death certificate is required. 2. Death Certificate duly attested by competent authority. a) Nomination serial number registered with us. (In case holder has registered the same with us). b) Will copy duly attested by competent authority. d) Indemnity Bond and Affidavit in enclosed format. I/We, undersigned being the Executor(s) of the will Administrator(s) of the Estate/Successor(s) to the Estate/Legal heir of Mr./Mrs./Miss _____________________________________________________________ (deceased) of which Probate/letters of Administration/Succession Certificate was dully granted to me/us on company in respect of _________ Shares in your company, now standing in the name of the said deceased in the Register of Members of your Company. I/We, hereby agree and bind myself/ourselves to hold the said shares subject to the provisions of the Memorandum & Articles of Association of your Company. I/We given hereunder such other particulars/information as would be required by you for your records. Names of the shareholders as registered with the company. Address of the First Holder. Note : Please enclose all share certificates for the folios mentioned above. I/We regret to inform you that Mr./Mrs. _______________________________________ who was a registered Share/Debenture holder in your Company holding _________________ Equity Share bearing distinctive Nos. (from)________________ to ____________ under Share Certificate No.________________________ died without leaving a will (Intestate)/ leaving his last will and Testament dated ________________________where of I/We am/are the only legal heirs/executors at _________________________________ on __________________________________ leaving behind the within mentioned person(s) as the only surviving legal heirs according to the Law of Instate by which he/she was governed at the time of his/her death. 1. Full Name of the Deceased Share holder and address. 4. Face Value of the Shares and Present Market Values. 5. In whose custody Share Certificate are? and reason for the same. 6. (a) Had the Deceased Share holder left any will. (b) Has the Estate duty & discharge certificate been obtained? Succession Certificate to the Estate of the Deceased has been obtained. (b) Estate duly despatch certificate. 8. Date and place of Death. 9. Full details of surviving legal heirs. Husband/wife/children/parents/brothers/sisters (if Hindu Joint Family, the names and address of the Karta and Do-parcehers with their respective ages). 10. Name(s) of the guardian of the Minor children of the share/Debenture holder. (b) Whether Guardian appointed under the Guardians and Ward Act. If so attach a certified true copy or duly attested copy of such order. (c) In whose custody the minor is/minors are? 11. The following persons have agreed to sign the Indemnity bond as sureties jointly and severally with all the surviving legal heirs of the deceased Share/Debenture holder. NOTE: THIS AFFIDAVIT TO BE EXECUTED ON NON JUDICIAL STAMP PAPER OF RS.20/- BEFORE A NOTARY PUBLIC DATH OFFICER MAGISTRATE. 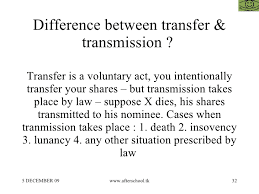 We further inform you that he/she left behind him/her as his/her only surviving heirs and next of kin the following persons according to the law of intestate Succession applicable to him/her by which he/she was governed at the time of his/her death. 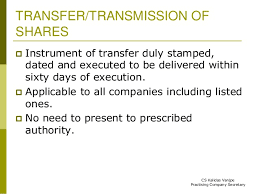 We have to state that the said Shares/Debentures bearing distinctive Nos.From _____________ to ______________________________ were registered in the name of _____________________ We have, therefore, approached you with a request to transfer the aforesaid shares as mentioned above in the name of the undersigned Mr./Mrs./Messers._________________________________ on my/our behalf without insisting on production of legal representations and you have kindly agreed to do so on my/our executed an indemnity as is herein contained and on relying on the information herein given by us believing the same to be true. we, the undersigned _______________________________ and ______________________________ hereby jointly and severally agree and undertake to indemnity and keep indemnified, saved, defended harmless you and your Successors and assigns for all time hereafter against all losses, costs, claims, actions, demands, risks, charges, expenses, damages etc. Whatsoever which you may suffer and or incur by reason of your, at our request, transferring the said shares as herein above mentioned to the undersigned ___________________________________ without insisting on production of legal representations. NOTE: THIS INDEMNITY IS TO BE EXECUTED ON NON JUDICAL STAMP PAPER OF RS 100/- BEFORE A NOTARY PUBLIC/MAGISTRATE/OATH OFFICER. 3) Sureties mentioned are different from each other. 6) Company Name is mentioned wherever needed. 7) All Legal Heirs have signed wherever needed. 8) Full Addresses/Bank Mandate wherever needed is duly filled. What process is to be followed for Lost or misplace of share certificate ? The value wise is Rs 100 or less? Simple application , with indemnity , affidavit will do?